PLEASE READ THIS ENTIRE LISTING BEFORE PURCHASING. THIS IS A PERSONALIZED DIGITAL PRINTABLE ITEM AND DUE TO THE UNIQUE QUALITIES OF DIGITAL ITEMS, NO REFUNDS CAN BE ISSUED FOR DELIVERED ARTWORK. This listing is for a customizable and personalized one of a kind piece of football artwork created from any of my very popular sports artwork! For 15 players, the cost of this artwork is approximately $8.00 per player for a one of a kind gift that can be framed and cherished forever! 1. 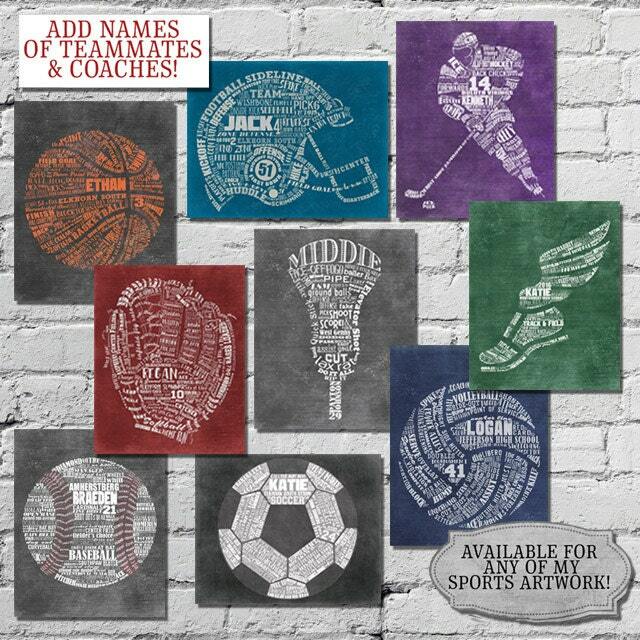 The addition of up to 15 individual names into the Sports Artwork itself (either first OR last names of players, coaches, managers etc.) - if you need more than 15 names added, please submit a "Custom Order Request" for pricing information. 3. The year ("2018") where a player's jersey number would normally go. Upon purchase of this item you will receive ONE completely personalized DIGITAL FILE of this artwork that can be printed by you as many times as needed for your team gift. (Meaning each player will receive the same piece of artwork.) The artwork can be sized from 8x10, 11x14 or 16x20. 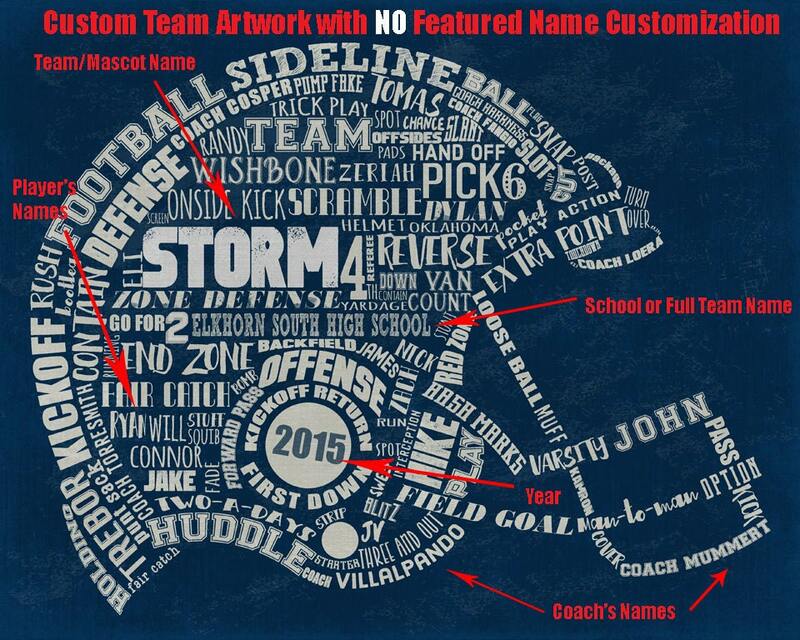 THIS ADDS THE COST OF $5.00 PER PLAYER/COACH TO THE COST OF THE ARTWORK, BUT THE FINAL PRODUCT WILL BE THAT EACH PLAYER/COACH WILL RECEIVE THE TEAM ARTWORK (INCORPORATING ALL OF THEIR TEAMMATES AND COACHES NAMES) BUT WITH THEIR NAME FEATURED IN BOLD IN THE CENTER OF THE ARTWORK AND THEIR JERSEY NUMBER IN THE ARTWORK INSTEAD OF THE YEAR. When you purchase this artwork, please submit the following information in the "Notes to Seller". Failure to do so may result in a delay in getting you your artwork. Cougars, should be simply "Cougars" as the longer name will not fit. to find the desired color. Orders processed within 7-10 business days, contact me directly for any rush requests. PLEASE NOTE! This listing is for a digital file ONLY - NO printed product will be sent. © 2009- 2016 Shauna Smith Photography + Design. All images are my original designs. So pleased! Top quality! Prompt communication and completion of transaction. Thank you! The coach and all the girls loved this gift. Unique, looks like a piece of artwork, only personal when looking closely for names and sayings. Becomes a bit expensive when you have to pay for the image to be printed or mounted as well, so factor that cost in first. Staples did a great job printing this a hard foam board for us. I ordered the baseball artwork. It exceeded my expectations. My son's baseball team had it framed for their coach and assistant coaches. The artwork was personalized with the players and coaches names along with the team name and the year. I had so many questions and Shauna was patient and prompt with her responses. Thanks, Shauna! I can't wait for the coaches to see this!